Diaper bags are a must-have when you are stepping out with your child. These bags are capable of carrying all of your baby’s essentials while keeping them organized and allowing you quick access. Thankfully, manufacturers have realized that baby diaper bags are also a fashion statement. You know very well that diaper bags have been around for a long time now. The chances are, even your parents had one when you were a child. However, you may have noticed that diaper bags from back in the days lacked color, design, and an overall appeal. They were quite boring to look at and were just made to serve one purpose. These days, however, diaper bags are completely revamped and are made to serve multiple purposes. Not just are these bags capable of doing multiple things, but they are also trendy and stylish looking. Also, there is no possible way that people would be capable of guessing that it is actually a diaper bag. With the growing demand, the market is full of different kinds of diaper bags. Some common ones include the messenger diaper bags, the backpack diaper bags, the convertible diaper bags, the stroller diaper bags, clutch diaper bags, designer diaper bags and the trendy tote diaper bags. Tote diaper bags are a very commonly used type of diaper bags. These are perfect for moms who need a stylish looking tote which has a ton of space within. Tote bags are mostly massive in size which is great for people who love being organized. There is a space allotted for every product within. It’s because of this that the tote bag is so popular amongst parents. Due to its popularity, many manufacturers solely produce tote bags in a variety of colors and designs, and each of them offers fantastic functionality. Another reason why it is so popular is because of its wide opening. When your child is restless, and you need to find something for him or her as quickly as you can, having a large opening allows you to find things within and in time. Hence, if you are aiming to have a tote bag and are confused with the plethora of options available, then you’re in luck. That is because we are doing an in-depth review of the very popular and stylish Danha Diaper Bag. The Danha Diaper Bag is available in a stylish gray color and has tan leather accents all over it. The bag is highly stylish and elegant. 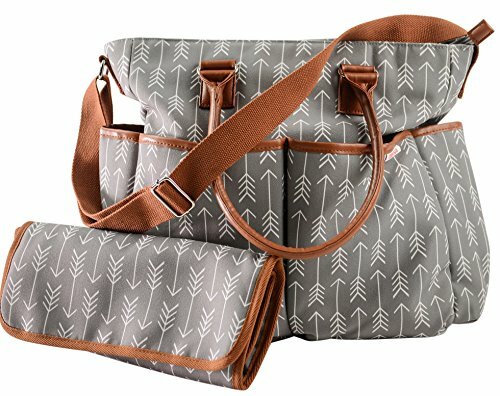 The modern gray color features an interesting arrow design in white, all over the bag. The bag has two small tote handles on both sides. The bag weighs about 2.4 pounds, and its dimensions are 16 x 5.5 x 15 inches. The interior and exterior parts of the bag are made from a very durable canvas material. This diaper bag can either be used as a tote bag or an across-the-body shoulder bag or can be comfortably clipped on to your baby’s stroller. All the attachments come complimentary. The shoulder strap has an adjustable length. For quick and easy access to things, the manufacturer has included pockets on the inside and the outside. There are secure zippers all over the bag which hold everything in its place. The bag all in all has ten pockets. There are four pockets on the outside of the bag and six on the inside of the bag. The main compartment has an opening that is wide enough and a zipper lock. On the inside, some pockets have elastic tops. These help in keeping the bottle or other things in an upright position to avoid any spillage. Along with the bag, you will also get a complimentary changing pad that matches the design of the bag. The canvas material is exceptionally sturdy. The company offers a 100% money back guarantee if you are not satisfied with it. The inside pocket is not too large to hold a diaper. The Danha Diaper Bag is a stylish and chic tote bag that offers a ton of space to store all your baby’s essentials. It has an extremely sturdy built. Additionally, it comes with a shoulder strap, a changing pad, and stroller clips. To top it off, it also comes with a 100% money-back guarantee offer if you are not satisfied with the product. When compared to the Novuss Diaper Bag, the Danha Diaper Bag definitely has the upper hand. To begin with, the design of Dahna is exceptionally great, unlike the black and polka dot design of Novuss which is overused. In addition, there is little space in the Novuss bag as compared to its counterpart. That means that your things won’t be very organized within or you will just not be capable of storing more items. It also has a less sturdy built since it is made of polyester material. On another note, the Danha Diaper Bag has a bigger opening than its counterpart, which is essential in moments where your child is restless and needs something from the bag. Moreover, it is a little lighter too. The best of it all, you will get a 100% money-back guarantee which the Novuss bag does not offer. It is quite apparent that if you need a tote-style, unisex diaper bag, then there is nothing better than the Danha Diaper Bag. The kind of space that exists within this bag not only helps you store all the essentials but also helps you in keeping them organized. The lightweight yet sturdily built bag yet takes another plus point; thanks to the fact that the company offers a 100% money-back guarantee.